An electrical transmitter stands in the foreground of this picture in the City of Regina, Saskatchewan, a sight which is not usually very pretty. 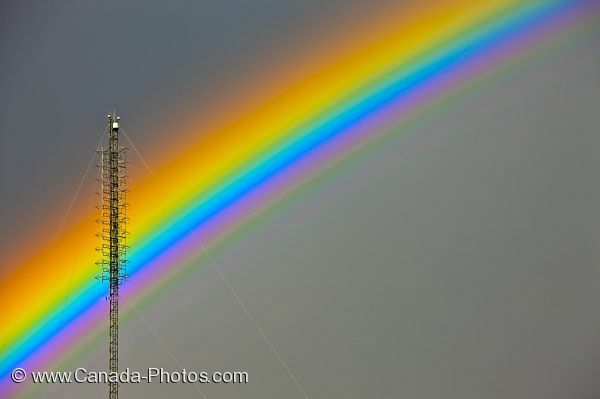 A colorful rainbow contrasts against the dark thunder storm clouds behind the transmitter creating a beautiful and intriguing picture. Arcing across the sky, this rainbow clearly defines the seven colors which are visible to the naked eye in the order they belong. Red decorates the upper part of the rainbow followed by orange, yellow, green, blue, indigo and violet. Storms can move into the prairie province of Regina, Saskatchewan quickly but can disappear just as fast as they came leaving the sky beautified with bright colors of a rainbow. As the rain, thunder and lightening leave the area, a glimpse of sunlight begins to break through creating the brightness of the rainbow. Picture of a bright and colorful rainbow above the prairie landscape of the City of Regina in Saskatchewan, Canada.